And Stay There For Months Without Any Extra Effort! Because YouTube ranks fully watched videos higher than videos only halfway watched or less… you could be (and probably are)…Wasting Your Time Creating Videos That Will Never Get Popular Enough to Send You Any Traffic. We’ve taken the the initiative and put together all of those features into one software. super easy – You’re the pro now ! 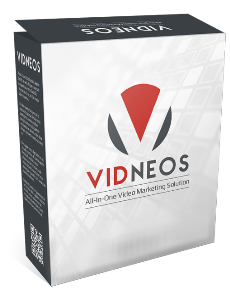 VidNeos was created for the entrepreneur who wants to make more money – while working less – by using the #1 fastest growing form of audience building today: VIDEO. >It is the only software program that can RESEARCH, ANALYZE, RANK and CREATE Videos – All in One. >Detailed video niche analysis – tells you exactly what to make your videos about and which keywords to use (for both YouTube and Google). >Built-in auto-backlink creation tool – builds you an army of ONLY high quality backlinks that will get your videos, blogs, websites boosted to #1 position on Google. >Custom algorithms to analyze and actually make suggestions about how to specially optimize your titles, descriptions, and even your tags to rank #1 for whichever keywords you choose. >How to "spy" on your competitors and see exactly what tags they’re using to rank (even if you don’t even know "who" your competitors are). >The ‘loophole’ companies like Coca Cola and Dove are exploiting to sneak their videos onto the screens of billions of viewers a month. >A secret, "back door" way of getting onto the first page of Google & YouTube with every video you publish by "stroking" Google’s SEO algorithms and using high volume / low competition key words. >Get Sales & Conversions from your video traffic by narrowing down to the right kind of viewers (the viewers who you know are already interested in buying). >How to "trick" other pro video marketers who get paid tens of thousands of dollars each month from their video traffic… Into Doing All the "Dirty Work" For You! >How to use YouTube’s "holy trinity" grading for fast-ranking videos… How to make yourself an instant "authority"… Why you should literally ignore most of the video marketing "checklists" out there today… And much more. >How to skip 90% of the research and still spit out HOT videos YouTube & Google love to rank. >Packed with tested & proven M8 algorithms (for research) bringing you the best research data available. >Keyword ranking tool tells you how your videos are ranking for several keywords at once. >Follows stories and trends around the web that have gone viral in the last 24 hours (or are about to) – so you can create viral response videos. >An easy to use interface with red, yellow, orange, and green color coded data to let you analyze data and make decisions quickly. >Ability to create videos with custom voiceovers, background jingle music, HD images, and more. >Works on Mac, PC, and Linux. >Built-in "crack" element, video marketers put in their videos that make it nearly impossible for viewers to stop watching. Like a personal consultant, looking over your shoulder and giving you step-by-step instructions and feedback…mistakes to avoid…and more! All you do is load up the software, and in minutes you can rock out a fully produced, stunning marketing video…published with the (exact) tags, keywords, and even video structures people are using to create potentially insane pay days for themselves using YouTube!